Start carrying your brand toward success with these personalized tote bags, imprinted shopping bags and custom printed backpacks. We offer inexpensive imprinted tote bags made from eco-friendly recycled materials, organic cottons, canvas, synthetics and paper. 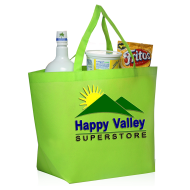 Custom tote bags are an inexpensive way to get your brand noticed. They have a huge imprint area! Have your business tote bag with logo carried by your customers and prospects through trade shows, expos, shopping malls and even to the beach. One of the major reasons that imprinted tote bags have become so popular is that they are reusable. They offer a solution to the large amount of plastic bags that are produced and quickly discarded. This, partnered with the materials used to make the promotional tote bags, is what allows us to see them as eco-friendly solutions. In addition to the fact that promotional shopping bags are made from a percentage of recycled material, they are more durable (allowing them to hold more groceries without tearing), as well as more attractive to look at than plastic and paper bags. Promotional tote bags also fold up and store neatly. The list of benefits goes on and on. If you want to raise awareness of your brand or cause, promotional shopping bags may be exactly what you are looking for. 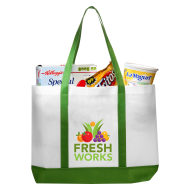 Your personalized shopping bags will grab attention because they are much more stylish than the standard grocery bag, while showing that your company or organization is also interested in recycling and preserving the environment. 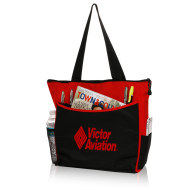 When people see your promotional tote bags, they will know that you are a trustworthy company looking to give back to the community. 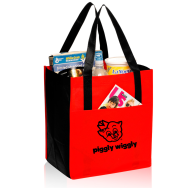 Order promotional shopping bags today!